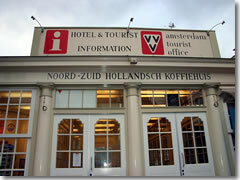 Tourist offices in the Netherlands are indicated by VVV (usually in a blue-and-white triangle). Amsterdam's most complete tourist office is just outside the Centraal train station at Stationsplein 10. There's also a small desk in the station itself, and another small branch in the heart of town at Leidseplein 26. The only phone number to call is tel. +31-(0)20-201-8800. The official websites are www.iamsterdam.com (city tourism authority) and www.visitamsterdam.nl (national tourism authority). An information desk covering all of the Netherlands is in Schiphol Plaza, at the airport terminal Arrivals 2.